Tonight is Pie Night! All Welcome! Join us for a traditional ‘Footy Pie Night’ tonight (May 30) as we come together to celebrate the women’s game as well as our passion for writing on it at the Almanac. Everyone is welcome – Almanackers, families, friends, supporters of women’s footy and supporters of hot pies and cold drinks! Tickets: $20 – click here to purchase. Ticket includes some pies and sausage rolls and a drink plus the panel. 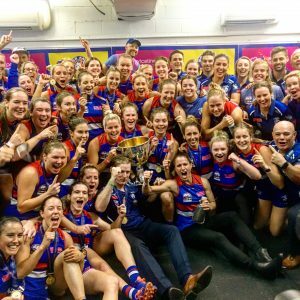 The event will feature a panel on the writing & media coverage of the women’s game from AFLW’s inception to what’s happening in the current VFLW season and wider issues in the landscape of women’s sports coverage. Kirby Fenwick: Writer, creator of The First Friday in February audio documentary, contributor to Balancing Acts: Women in Sport recently published by Brow Books. The panel will be hosted by our Women’s Football editor, Kasey Symons. Tickets for the night are only $20 and include some pies and sausage rolls and a drink. This event will be a great chance to catch up with fellow women’s footy enthusiasts and Almanackers for a chat, as well as hear from some incredible women doing great work on and off the field in the women’s game. Thank you to the Fitzroy Bowls Club for supporting this event. Yes, tickets at the door. Kids free. A great night. Well done Kasey, Yvette, and The Almanac.